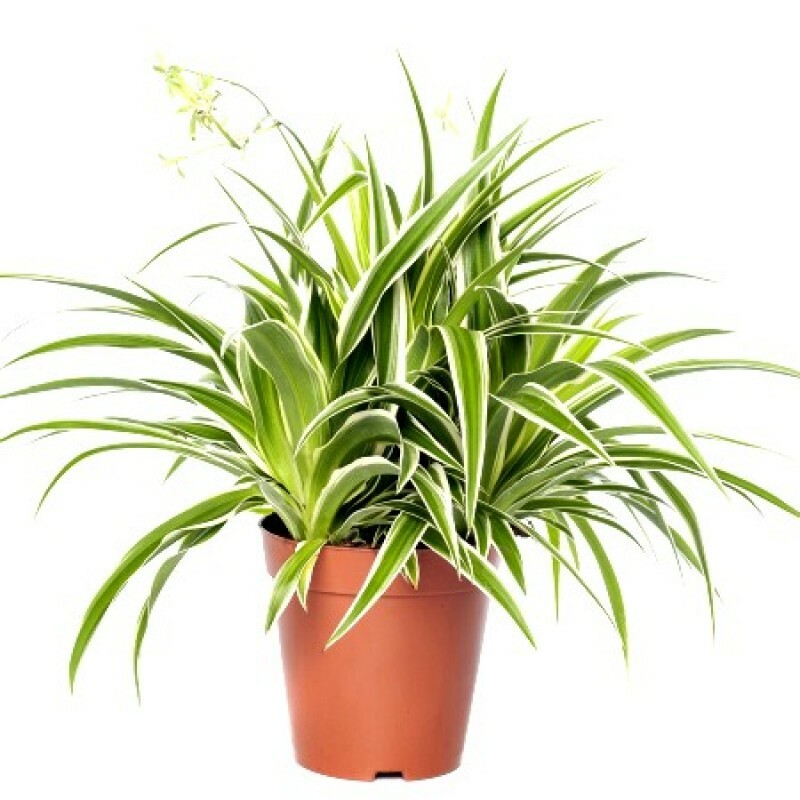 The spider plant is wonderful house plant, they are tough making them great houseplants for beginners. The Chlorophytum comosum (the botanical name) is one of the most common yet popular houseplants. It is also one of the “Top Clean Air Plants.” Spiders not only are tough indoor plants but they make wonderful “test plants” for those looking to learn about house plant care. “Spider care” is easy and most of the time only flat out neglect can kill them. Overall, the Chlorophytum is a quick grower putting out “babies” on long stalks, variegated strap like leaves coming from its center of the plant. Their spider-like long stems leaves come from the plants’ center with usually green edges and a white stripe running down the middle. Some varieties have white edges and a green central stripe. When buying “spiders” look for clean, untorn leaves with no brown tips. Most of the time the Chlorophytum plants seem to find its home indoors in a hanging basket where it makes an attractive display. As the "airplane plant" throws out long stalks or stems it will produce small flowers followed by the decorative hanging "babies". The plantlets make propagation a simple task. The young plants when rooted can be replanted and transplanted outdoors and used summer bedding, but when planted this way they will need protection from direct sun. The Chlorophytum originates from South Africa and grows easily in hydroculture (growing in rocks). Keep it well fed and pot-bound. When its stems fill the pot, and when the white, wormlike rhizomes bulge over the surface, it can divided easily. Height: Plants grow up to 1 ft (30 cm) tall, with stems trailing to 3 ft (90 cm) in length. Light: Bright light. Keep plant out of direct sunlight because it can scorch leaves. Water: Keep soil evenly moist. If your tap water contains fluoride, use distilled or rainwater. Humidity: Moderate indoor humidity. If the leaves turn brown and crispy, raise the humidity around it. Temperature: Average room temps 65-75°F/18-24°C suit this tropical plant perfectly. It doesn't like the cold; don't expose it to anything below 50°F/10°C. Fertilizer: Feed every 2 weeks spring through summer with a liquid fertilizer diluted by half. Propagation: Plantlets. Set a small pot filled with damp potting mix next to the plant. Sink a new plantlet into the soil of the small pot, so that the root buds are barely covered. You may need to use a bent paperclip to hold the plantlet in place. It should root in 2-3 weeks. After that time, sever it from the parent plant.